The Pike County Conservation District (PCCD) conducted its annual stream sampling in May 2014, continuing years of water quality monitoring in Pike County streams. Sampling began in Dingmans Creek and Hornbecks Creek in Delaware Township, Pike County. The District’s new Watershed Specialist Vincent Cordova, who has responsibility for coordination of the Conservation District water quality program, laid out a full schedule for this year’s stream monitoring which included just over twenty (20) stream locations throughout Pike County. 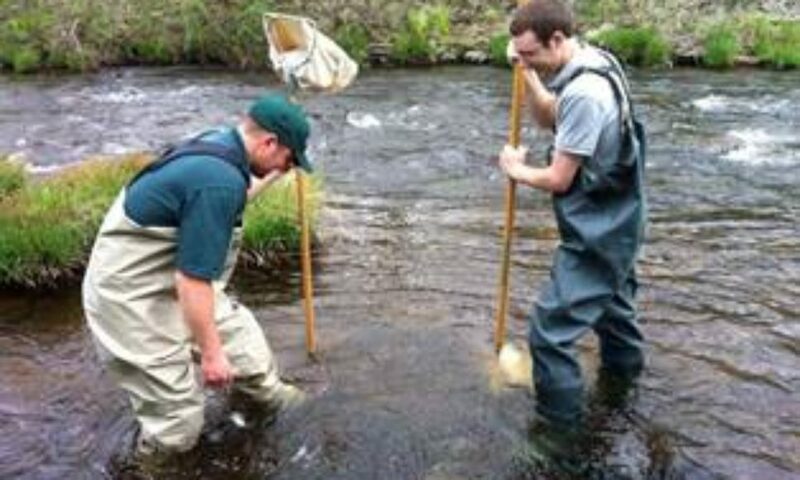 This year’s water quality monitoring included streams such as the Lackawaxen River, East Branch Wallenpaupack Creek, Sawkill Creek, Toms Creek, Shohola Creek, and more. District staff and Board members participate in this watershed work. The Conservation District spring program includes evaluating stream habitats, recording data such as temperature, pH, alkalinity, conductivity, and dissolved oxygen, and collecting macroinvertebrate samples from each stream location. Aquatic Macroinvertebrates are small in-stream organisms (primarily insects) which can provide a good indication of stream health, as they are fundamental sensors of stress in a stream ecosystem. Macroinvertebrate samples are later analyzed to determine species and in-stream diversity. This information provides an excellent overview of stream water health and similar data assembled from past years allows comparison and evaluation of any trends which may be occurring.